They opened up on their ordeal at the state police command after the arrest of one Dada Ogundare, who allegedly facilitated their journey to the slave camp. Mr. Ogundare was paraded alongside a supposed prophetess, Omoseeke Komolafe. They were said to have collected an undisclosed amount of money from the victims’ parents for the trip. However, the suspects claimed that they only assisted the young ladies, one of whom was pregnant, to seek employment outside the country not knowing that they would end up as slaves. The victims left Nigeria on November 25 by road through the desert instead of going by air as promised by the suspects. They were also taken to Libya instead of Dubai, where they were reportedly sold as slaves. Magareth Olorunfemi, one of the mothers of the victims, said they later learnt that their children only ended up being trafficked and sold to slave traders. She said efforts were made to get the girls back, but the traffickers holding the girls had demanded N1.2 million each to free the girls. She said herself and the prophetess were members of the Peoples Democratic Party, PDP in a ward at Ikere Ekiti where the deputy governor also belongs. Mrs. Olorunfemi disclosed that Ms. Komolafe told her daughter that the deputy governor had been given four slots to be given to children of party members in his ward to travel to Dubai with the payment of N150,000 to facilitate the trip. She said she became worried after the kids embarked on the trip, when she did not hear from her daughter. According to her, she later was able to speak with her daughter on December 10 who told her that she was in a slave camp in Libya. “My child called that the prophetess had sold her into slavery that we should go and meet the deputy governor, that we should get N1.2 million before they can be freed from slavery,” Mrs. Olorunfemi said. Feyisayo Adedayo, another parent who reportedly fell victim to the traffickers’ tricks, said her daughter is pregnant. “My daughter, Ayomiotan, spoke with me on the phone that they went through the desert and not by flight as they were promised,” she said. “I don’t have N1.2 million to send to them to free my daughter. (Ekiti State) Government should return my daughter to me with her pregnancy. The third woman whose daughter was also reportedly enslaved, Bukola Bamise, said she was shocked to learn that her daughter had been sold as a slave. “It was the deputy governor that said he wanted to use the four slots given to his ward to benefit our children but I was shocked to learn that they were camped somewhere and they had been sold as slaves,” she said. He also claimed he didn’t collect any money from the victims. Mr. Ogundare, who explained that his wife and younger sister were in Libya, added that he told the prophetess to inform the girls’ parents of their destination. “I didn’t collect one naira from anybody, I have so far taken four persons to Libya while madam (prophetess) had taken nine persons to Libya,” he added. 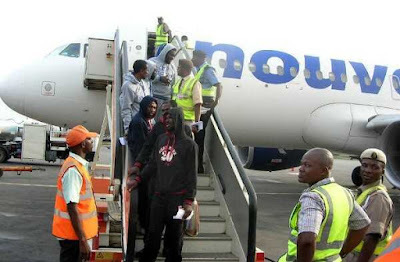 The Deputy Commissioner of Police in charge of Criminal Investigation Department (CID), Julius Okoro, warned parents against allowing their children to embark on questionable trips. “The girls were trafficked to Libya on the pretext that they were taking them to Dubai,” Mr. Okoro said. “Information reached their parents that they are suffering and they had been sold out in the slave camp in Libya. “One of the girls trafficked to Libya is pregnant but was rejected by those buying them because of her pregnancy. We understand that they are suffering seriously in Libya. “Our advice to parents is that they should be careful of those they entrust their children to. Let them be careful and be sure of the persons they are handing over their children to,” he added.